Barry Wood has finally put up his NAMM 09 Oddities page. There was this interesting item. The QiVinci s is modelled on the classic music stand and was conceived especially with performing and learning string- and wind-musicians in mind. With QiVinci s, the musician can dedicate his full concentration to the music, rather than interrupting the flow of his performance at the end of every page. 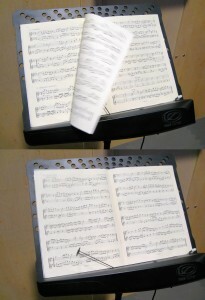 By means of a foot switch, the pages are turned automatically, silently and inconspicuously. Whether learning or in the midst of a concert performance, the QiVinci s provides musicians with an elegant, stress-free way of playing from one page to the next. QiVinci s not only opens a new repertoire to the concert musician, it also accelerates the practice process for the music student.